I’m testing out Ulysses III for writing and so far I am finding it postively interesting for a 1.0 rewrite. One thing I wanted to try was to use it for notes alongside nvAlt. Here’s how to share notes between Ulysses III and nvAlt. In Ulysses III, click the plus icon on the bottom left (1) and choose Add External Source... (2). Choose the folder in Dropbox where you store your nvAlt plain text notes, then click Open. Note that if you just drag and drop your nvAlt folder into Ulysses III, it will copy all the notes, not reference them. In my case, I store my nvAlt notes as plain text files in my ~/Dropbox/Notational Data folder. As you can see, Ulysses III picks this as a Dropbox folder (with the cloud icon) and displays all your notes as sheets. Ulysses III also displays (and sets) the file name in a special comment line at the top starting with @:. When you create a new Ulysses III sheet in this folder, you need to set the file name there (or use your TextExpander shortcuts). 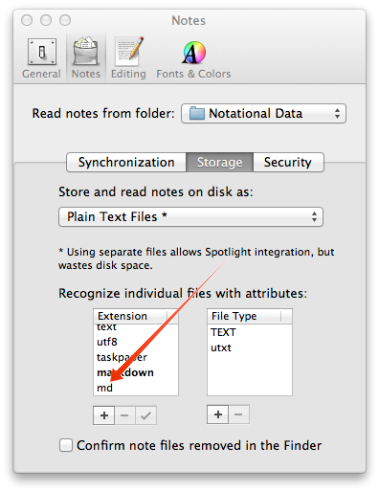 Make sure that .md is a recognized extension in nvAlt / Preferences / Notes / Storage because that’s what Ulysses III uses. In Ulysses III, right click on your notes folder and choose Edit.... Check Always assume Markdown syntax. That way, all your nvAlt notes will render and edit properly. More on Ulysses III will follow as I continue to test out the product.